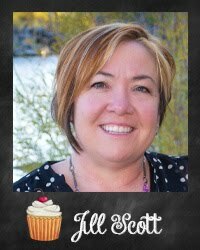 I'm here today to share with you the new direction I've taken with my recipe organization and menu planning. I'm transitioning to an all digital system and it is rocking my world. In a good way. It's got me feeling all kinds of on the ball with my inner Domestic Goddess. Granted it might all crumble like a Chips Ahoy cookie once school starts, but right now it's looking pretty ding dang awesome. What has changed for me is this little app called Paprika. 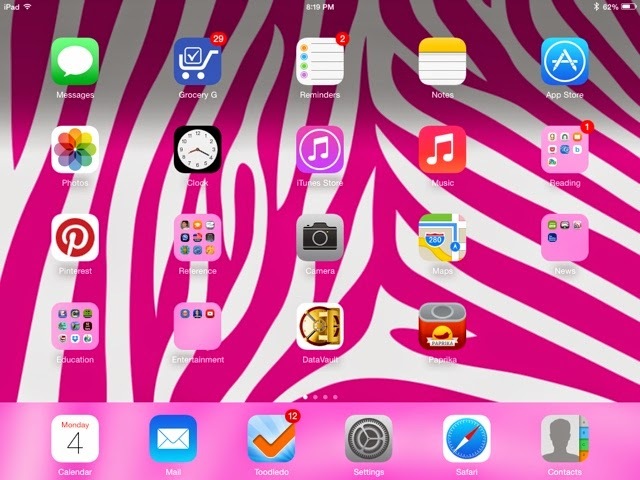 In the screen shot above, it's the last app on the right, in the row one up from the bottom. Do you see that cute little red spice tin with the yellow circle and the red bird chili pepper inside? It's my new BFF and I'm telling everyone I know about it. C'mon with me and take a look inside. This is what my app looked like when I opened it today. So far I have 23 recipes tucked inside, all snuggly and happy. 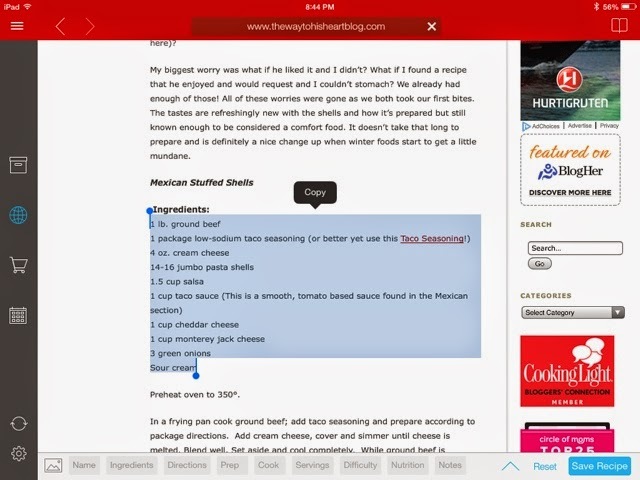 Watch as I demonstrate how to add a new recipe. 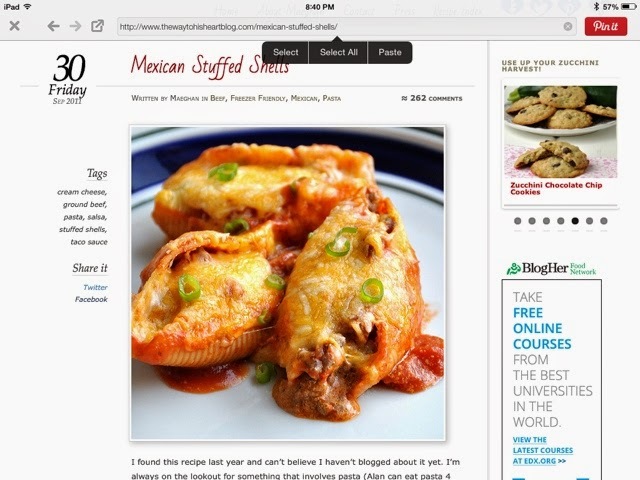 Here I am starting with one of my recipes on Pinterest in the Pinterest app on my iPad. 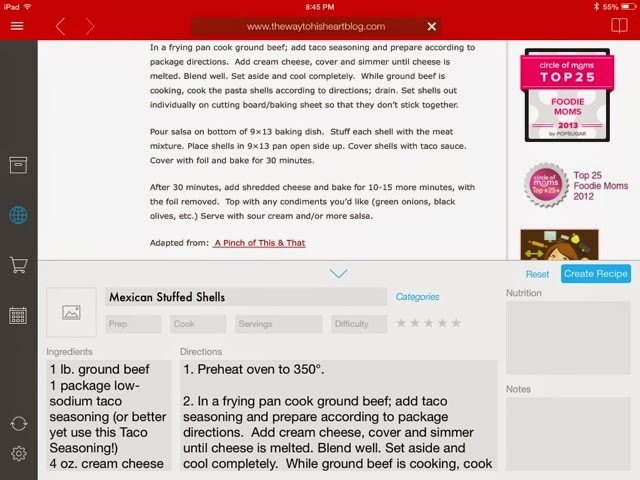 From here, I want to highlight the URL for the recipe by tapping on its web address at the top and tapping "Select All." Once it's highlighted, I tap on "Copy." Now I exit the app and go into the Paprika app. If you're lucky, upon opening the app it will give you a message that it has detected a URL and it will ask if you want to load that URL. If that happens, you will want to say yes, PLEASE, and the webpage will open up within the app and everything will go smooth like butter and super slick without a tutorial from me. If not, you'll follow these still pretty easy steps. 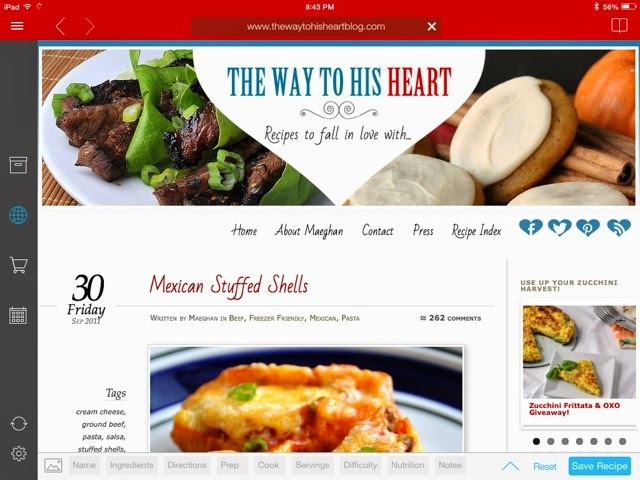 Go to the web portion of the app by touching the globe on the left and second down, and this page will come up with all of these popular recipe sites listed. Simply highlight the web address in the bar at the top and select "Paste" to drop in the website URL you want to navigate to. There's my recipe. It's magic. Now, I'm going to tap that little blue button in the bottom right corner that says "Save Recipe" and cross my fingers while it processes. If all goes well, the recipe will load in all the appropriate spots in the app, and usually it does. 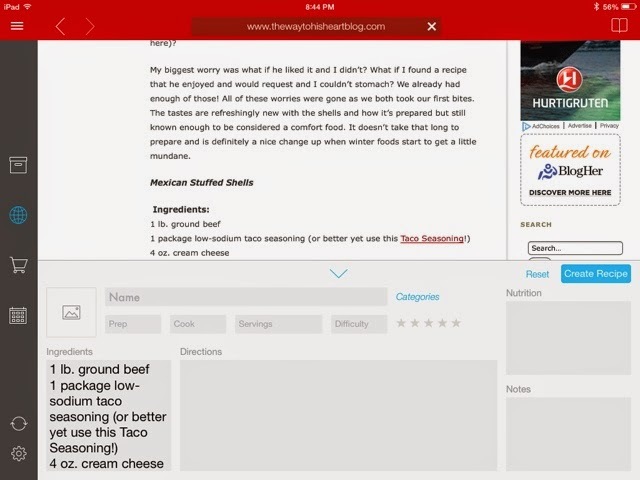 The majority of the time I've been able to input my recipes this easy way. If it does not work perfectly, you will see this. Dang. Why you gotta be so mean? Never mind, there's still a pretty easy fix for this. 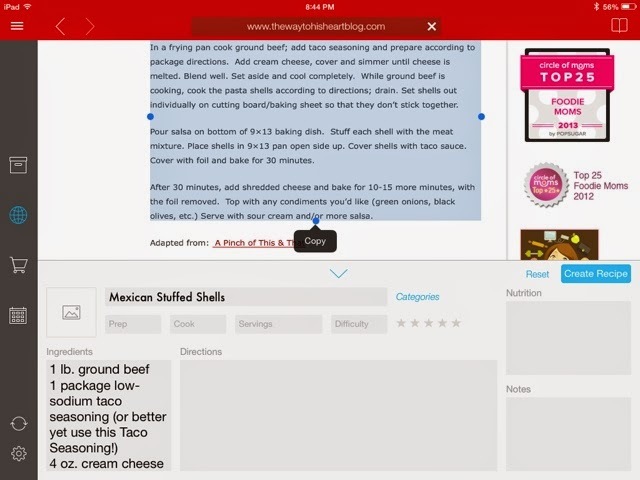 Start by highlighting the text for the ingredients and tap "Copy." Now watch this. I'm just going to touch the grey boxed area on the bottom left of the screen where it says Ingredients and the ingredients will magically paste themselves into the box. Repeat the same steps for the Directions. Now here is where I'm going to show you one of my little OCD steps that I like to do. When I'm following a recipe, especially if it's a new recipe, I tend to get a little discombobulated and I get lost easily. With this app, I'm loving that I can go in and break down the directions into numbered steps with plenty of space between them. I'm not limited on space and I can even go into the settings in the app and set the font size to "Old Lady Has a Problem with Her Seeing." I can't even tell you how much this excites me. With my ingredients and directions finished, now I need to add the picture, right? This can happen one of two ways. In the first way I click on the picture and this window pops up. If you aren't in the Paprika app, you will want to select "Save to Photo Library" then go into the Paprika app, tap on the spot for the picture, and access the picture in your photo library. If, however, you are in the Paprika app, which by the way I highly recommend because it will save you time and excessive opening and closing of apps, you can tap on "Copy Image" and it will magically insert itself into the spot for its picture. Like it did for me here. It's a beautiful thing. Lastly, I would go in and fill out the prep time, cook time, servings, and difficulty. 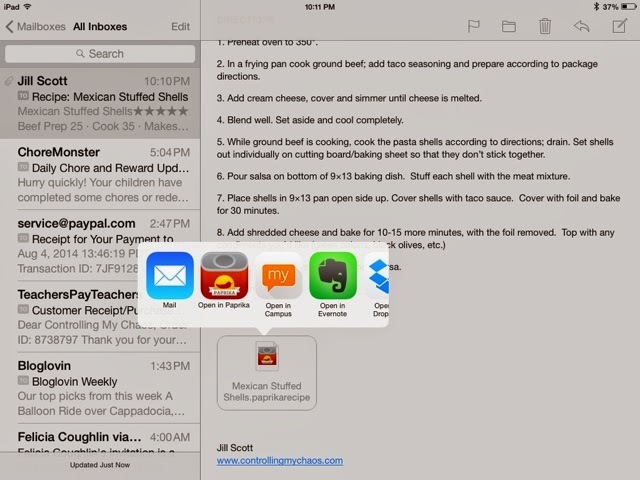 If your recipe imports without all the cutting and pasting, all this will be done for you. 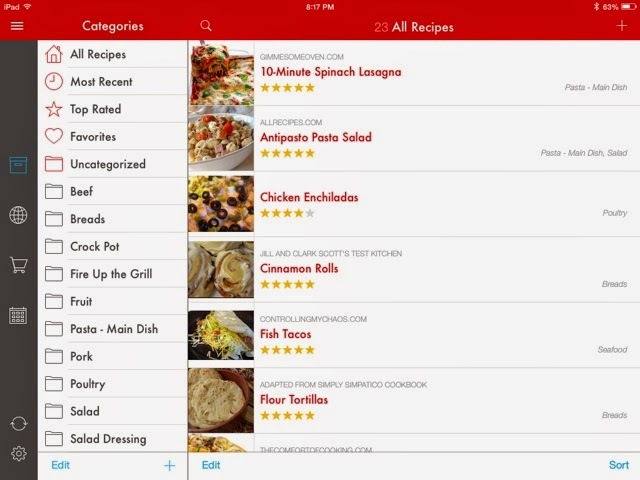 You will also want to give your recipes categories for better organization. 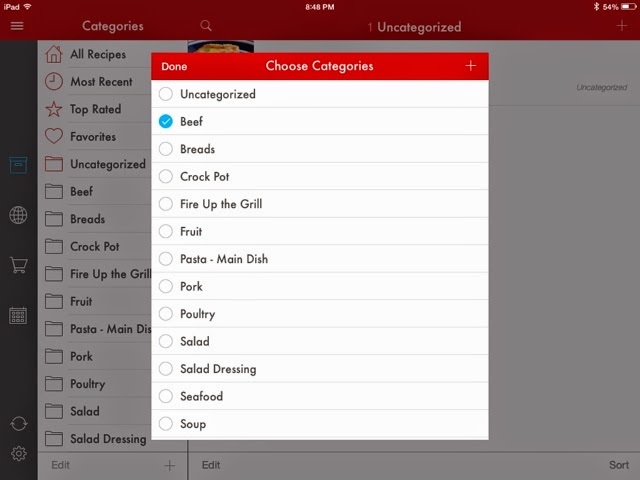 You get to create your own categories so you aren't forced to adhere to someone else's idea of good recipe categories. You do what makes sense to you. These are some of the categories that I've created so far, although I'm just getting started with my recipes. I know that I could potentially stress myself out trying to get all my recipes in here, so I just decided that as I collect recipes (when I see them in magazines and am tempted to tear them out, when I find something on Pinterest I want to try, etc. ), I will add them then. Another good time to do it is when I'm doing my menu planning (if I'm not rushed for time) with just the recipes that I'm going to make that week, or right after I've made the recipe and the clean-up in the kitchen is done. 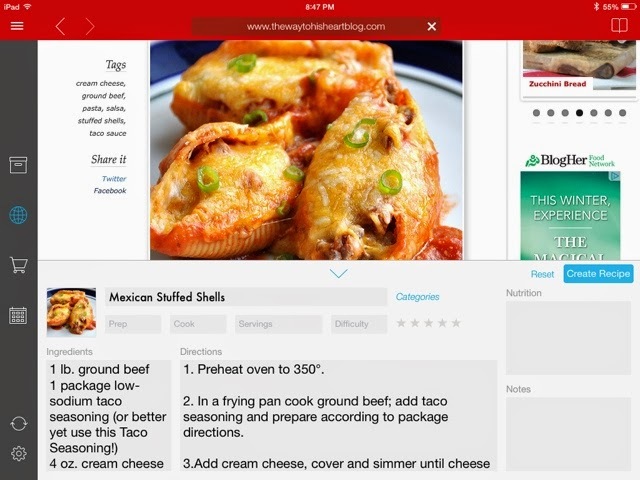 You will also want to rate your recipes (0 to 5 stars) once you've made them. 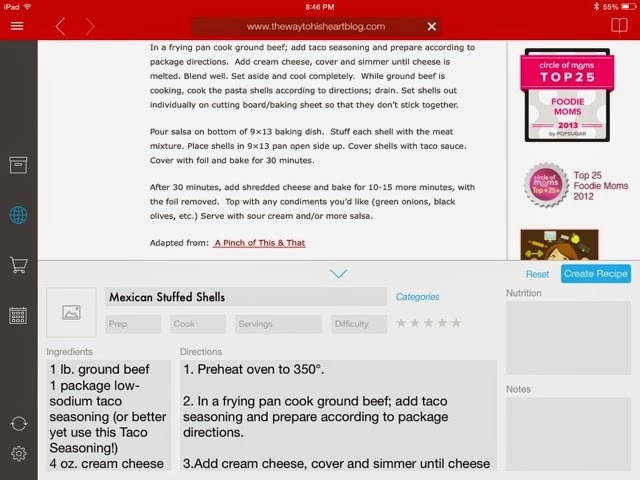 Another feature I love about this app, is that I can tweak and edit all the recipes I bring into it. It doesn't matter where it came from. Honestly, it's a pretty rare thing for me to not change something about a new recipe, so this feature is a must. For example, I absolutely loathe green bell peppers, so if a recipe calls for them, you can bet I'm going to be changing that to red, yellow, or orange bell peppers. There is also a spot for notes. There are infinite uses for this section. You could keep track of who in your family liked the recipe, comments that were made, adjustments you might like to try next time, and on and on. This is another super cool feature that I looooooooove about this app. I'm talking super big, pink puffy heart love. 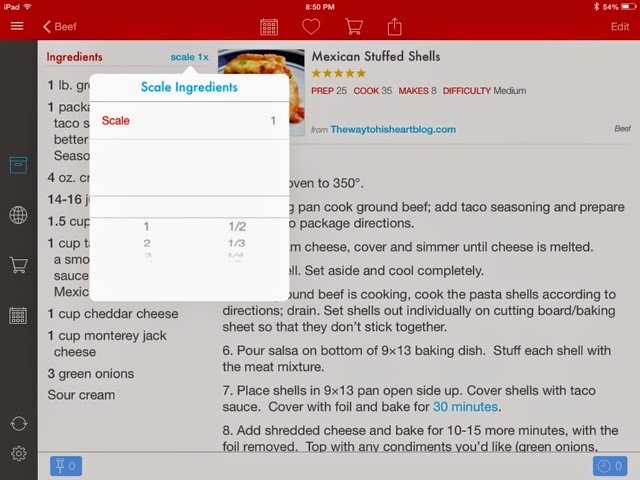 You can change the recipe scale! Seriously, how cool is that? A couple days ago I input a recipe that I swear was for a family that is exponentially larger than my own, so I scaled the recipe down to be a fraction of the original and all the tedious work was done for me. Not that I don't love to do math, being a math teacher and all. In fact, I admit that I had to double check all the calculations to make sure that this app didn't need some help with its math, and I'm happy to report that it gets an A+ and I probably won't double check its skillz in the future. Probably. My Mama Llama is visiting this week and I got her hooked on this app. She is cooking for one most of the time, so this feature is a big plus in her world. And if you still aren't sold on this app, check this my friends. 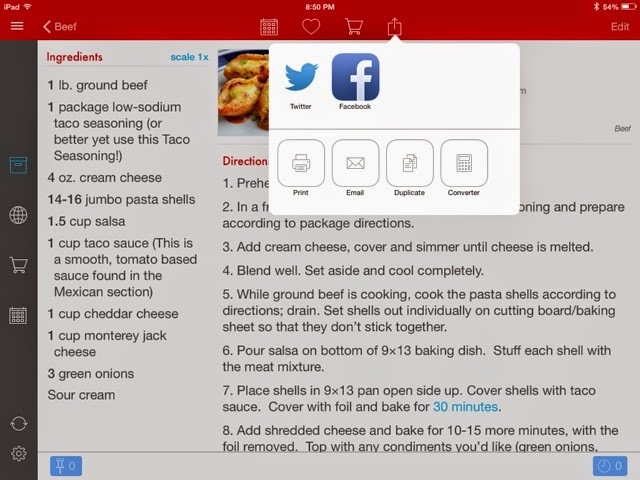 You can share recipes with yo' friends and save them from all that pesky copying and pasting. 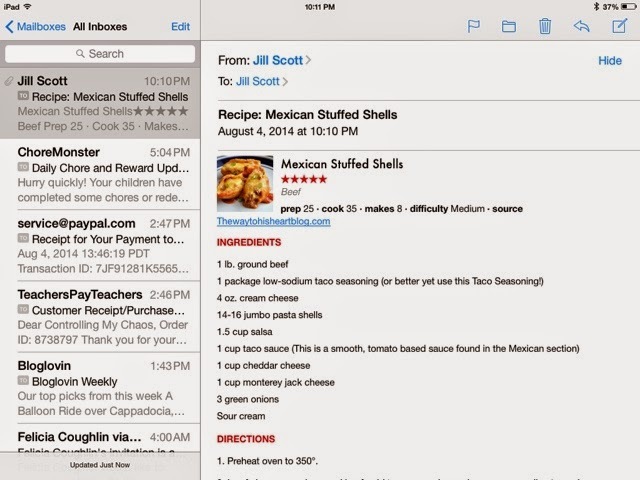 I did this several times with my Mama Llama, and this is what it looks like when you e-mail recipes to people. 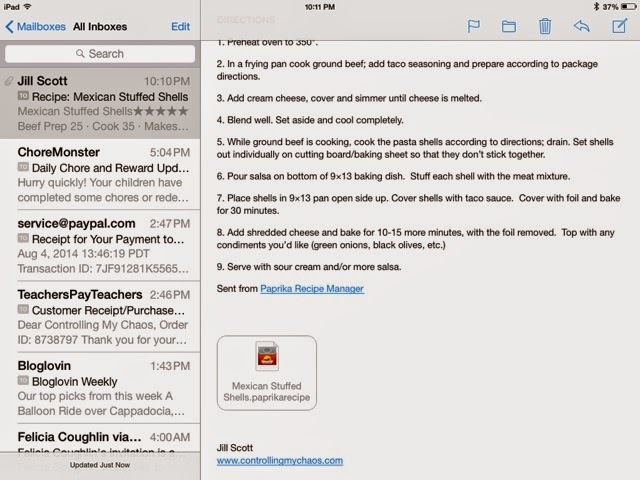 Ya, I emailed this recipe to myself. I had to. Everyone else is in bed and therefore unable to cooperate. In the past when I've woken them to assist me in my bloggy pursuits, it did not end well for me. I learn the hard way. So anyway, the recipe is e-mailed so that anyone, including your Grandma, can read it without any problems. That is, of course, assuming that your Grandma knows how to access her e-mail without calling you for help. This is not a perfect world though and we all have people in our lives who are technologically challenged. We must be patient. It's my mantra because I'm so impatient by nature. And trying to be a better person. Focusing attention away from my rant, this is the Neato Benito part of sharing the recipe with yo' friends. If they have the Paprika app they just tap that cute little attachment and you, my Friend, have done all the work for them and they will therefore love you for-EVAH. Next they have to tap the cute little Paprika can. I just get so excited when I do this part. 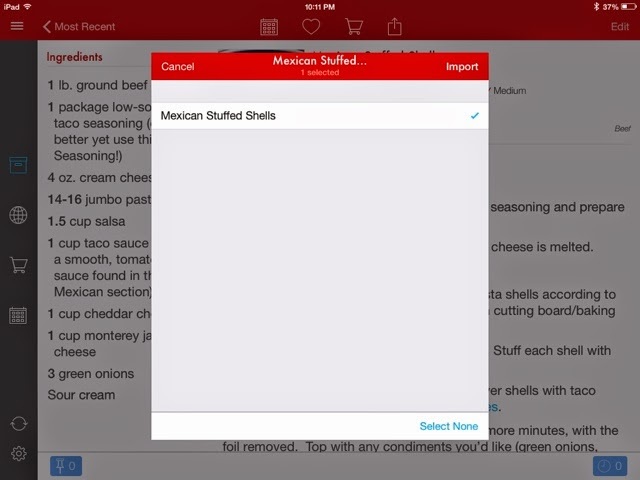 Then tap on that magical word "Import" and angels will sing as your recipe is added to your app. You will still need to go in and assign a category to it, and rate it when you are ready to, but everything else is there for you. 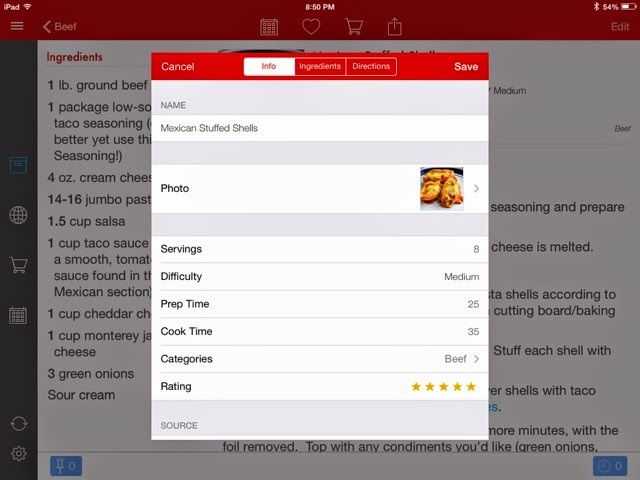 The last thing I want to show you about this app is the Menu Planning feature. 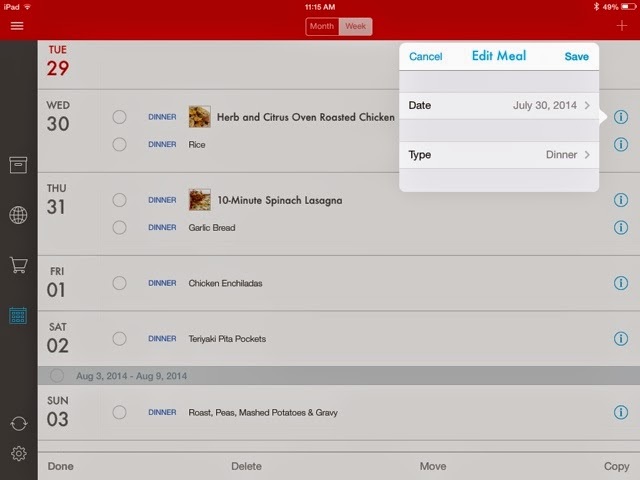 Having my recipes and menu planner in the same app is ultimately what sold me on it, everything else that I love came after that part. I appreciate being able to do all of it within the same app. 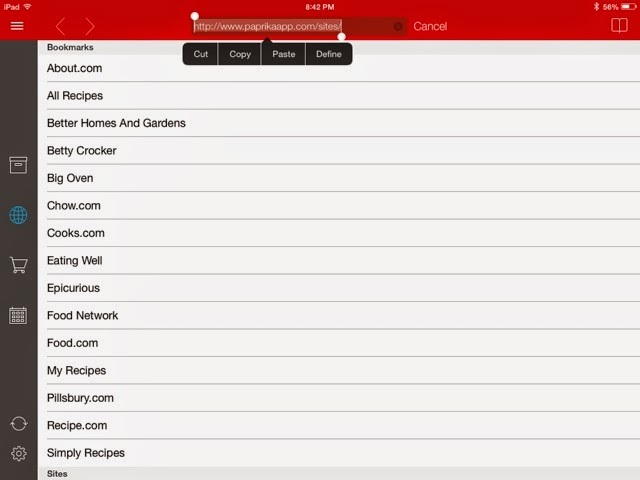 In fact, it even has a grocery list component, although I have not experimented with it yet because I'm already using another grocery list app. In time, I imagine I will be using that as well. You access the menu planner from the calendar icon that is highlighted in blue on the left of the screen shot above. This is what my current week looks like. 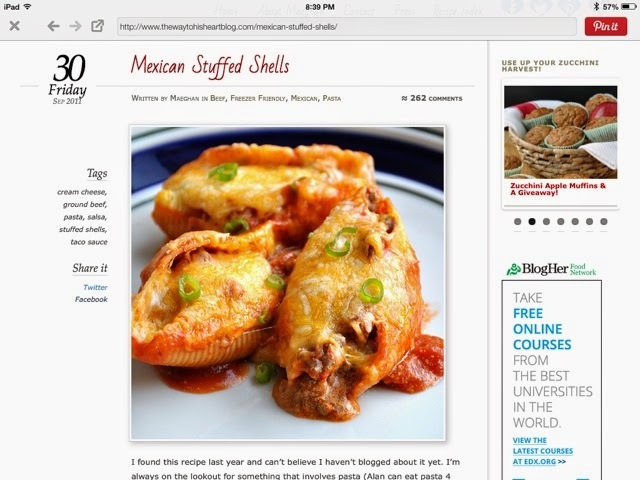 The menu items with pictures are those for which I have recipes already in the app. The others are added as a note. 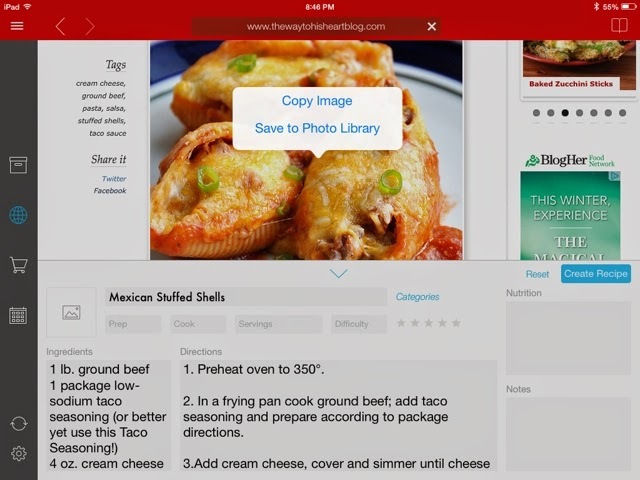 I love this flexibility because, let's face it, ain't nobody got time to sit down and put all their recipes and their Grandma's recipes into the app in one sitting. It's going to take some time. This is a screen shot showing you how to access an item to make changes. This is where I go when I want to change the date for a menu item because, oh, stuff happens. Or I don't wanna. Whatever the reason, you have the power. As a side note, I still have my magnetic menu planner posted so everyone else can see what the plan is and I know, at a glance, what things need to be taken out of the freezer when I'm on the fly. Why am I always laughing alone? Now for the negatives, because you know there are always negatives. This app is $4.99 and you have to buy it for every device you put it on. For example, if I want it on my phone and my iPad, I have to buy it twice. If Peanut Head wants it, and he will because I told him he will, he has to buy it. I'm sold on this app enough that I am willing to pay that. There is no yearly subscription though, like some recipe apps. Another feature that I like, considering we will be using this on multiple devices, is the ability to synch across devices. Oh yeah, and Paprika is available for iPhone, iPad, Mac, Android, Kindle Fire and Nook Color. I don't know if you can beat that. So what do you think? Will you give it a try? Are you using it already? Do you think it's stupid? Talk to me. It sounds great! I am going to give it a try. Does it have a backup or something so nothing gets lost? Stacy B.
Stacy, you set up a free account and it is backed up to the cloud. You can also install it on your desktop (but for another $4.99) and store it there as well. 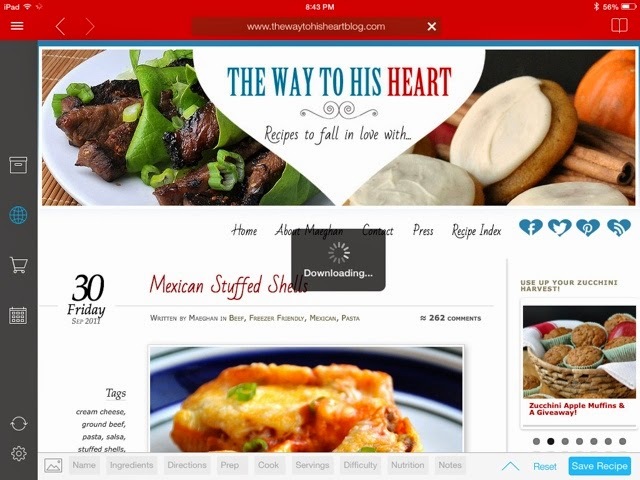 Storing your recipes in the cloud is what enables it to synch across all your devices. 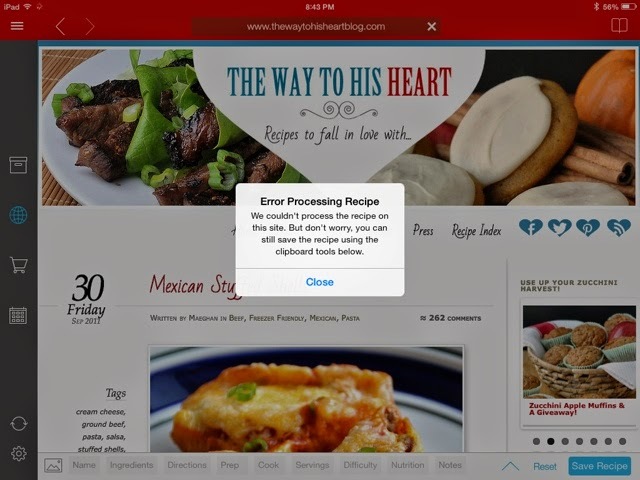 However, you don't have to have Wi-Fi to access your recipes. Rosie, I think you're right. Old lady needs help with her seeing, you know. :) I'll fix it. I've been using Grocery Gadget and it took us awhile to get it set up and get comfortable with it, so I'm just not looking forward to starting all over again. 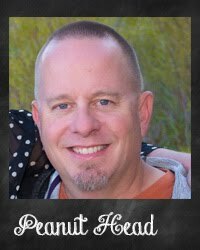 I'm sure that once Peanut Head is using the app, that will speed things along. Thanks for sharing your experience, I appreciate it. 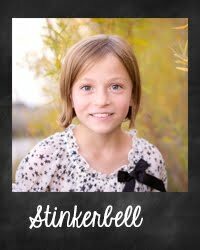 This is your cousin Jenny. Can't remember my login so replying as anon! Glad to see you are getting into the digital world. 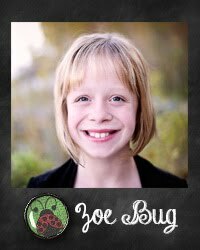 Miss all the cute creative things that you did manually though with meal/recipe planning! If you could improve this app with cuteness then it would be perfect! I think I will give it a try. I would be interested to know if you use any app to keep track of what you have on hand or need in your pantry! lilsys, I do not use an app for that purpose, but I'm intrigued. I wonder how faithful I would be about recording things that I take out of the pantry though. Not to mention other family members. That might drive me to drink. Thank you!! 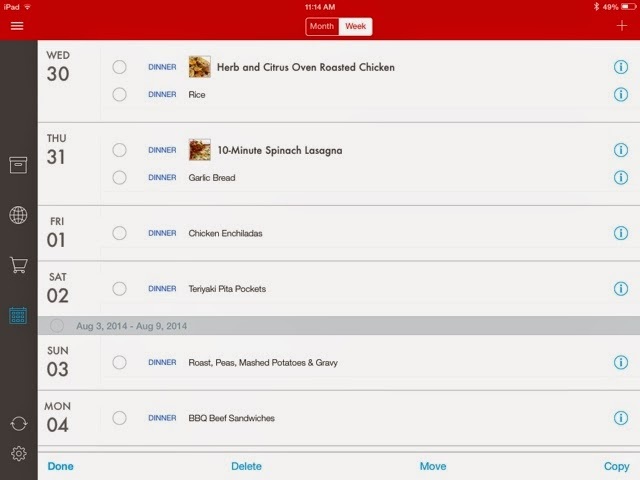 Love this APP - I love that I can meal plan on it and then have it go right to a grocery list! Amazeballs! 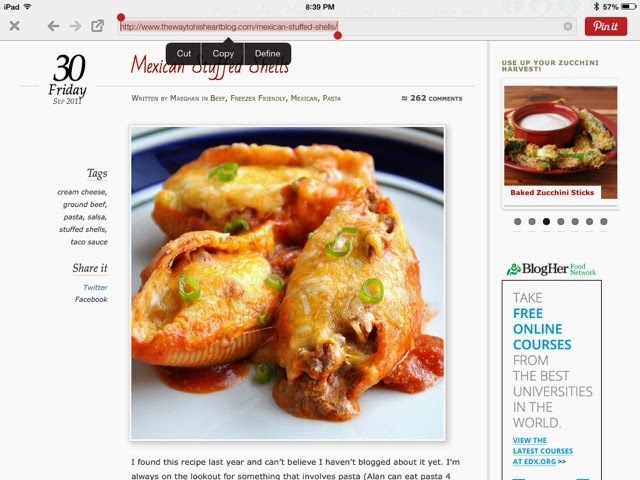 I also love that I can access the food blogs I read right inside the app! When Are We Ever Going to Have to Use This?